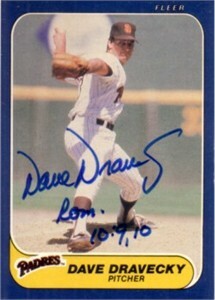 1986 Fleer card autographed by former San Diego Padres pitcher Dave Dravecky, who later made an inspirational recovery from cancer to pitch for the San Francisco Giants. With certificate of authenticity from AutographsForSale.com. ONLY ONE AVAILABLE FOR SALE.